4/7/13 - Haven't updated the new section in awhile. Just been building and customizing guitars. When something I think is somewhat exciting happens I'll post it...thanks for the continuing interest. 2/14/10 - The Luthier's show went great...if you have a chance to get tickets for next year before they sell out again then you'll be in for a real treat of a show. We're working on getting a video of my performance up on the site within the next few weeks so check back. There also may be a complete recording of the live show available as well but we'll keep you updated on that. 1/21/10 - Ok, here is something Michigan guitar players might be interested in. I will be showing my guitars as well as performing at the West Michigan Luthiers 2010 show in Fremont, Michigan. This event is to highlight guitar makers in Michigan and displays will be up for the reception for you to check out their products. 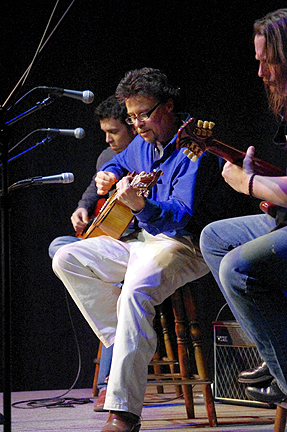 Then all the luthiers will get a chance to play some music on stage...I will be playing about 3 songs. Please come and make this event as fun and interesting as it promises to be. Stop by my table and say hello and try out some of my handcrafted instruments. 9/27/09 - Saturday also went well though it was a long day of playing. Huge numbers of people were out and about and we even got a few colorful characters happening by. As well as having my band play, my brother Fred also sat in and played for a few hours. It looks as if we will do this again (maybe only for a few hours this time) this coming Saturday (Oct. 3rd). At this point Art Prize will be in the 2nd phase of voting and there won't be the pressure for everyone to get around to see everything (though that's still a good idea). More folks might feel like sitting and listening to us play this way. I will post an update here about Saturday and what time we'll be playing...and where....so far at Independent Bank but we may also take it over to Rosa Parks Circle....not real sure yet so check back. 9/24/09 - Well, the opening of Art Prize '09 last night went great! We played for a few hours and lots of people came through and got to see my guitars up close for a change. This art event is big and promises to be a fun couple of weeks so if you are in the area then stop by and see for yourself. It looks like we'll be playing some more throughout the day on Saturday (Sept. 26th). About 1-3pm and 5-10pm at the Independent Bank venue so come down and listen to some music and see a ton of art. More live music dates during the next 2 weeks to be posted as we go so check back! 9/16/09 - Ok, the first day I'll be playing at the venue will be on opening night, Sept. 23rd from 6pm - 10pm. There will be a catered reception for all at the Independent Bank venue so come on down and have some fun with us! Make sure that you go to artprize.org now and get registered to vote for you favorite artist. This massive art show will run from Sept. 23-Oct. 10 and I will be displaying at Independent Bank on Monroe St. I will need some "help" from anyone in the area as all the artist's pieces will be judged by the public via online votes. This is new and a very unusual art show and may be one of the biggest in the world. If you are ever looking for something to get out and do then this mark your calendar. I will be playing music outside the venue that I am showing at and will post here exactly when I'll be doing that. I expect to get some of the best players in town to also participate. 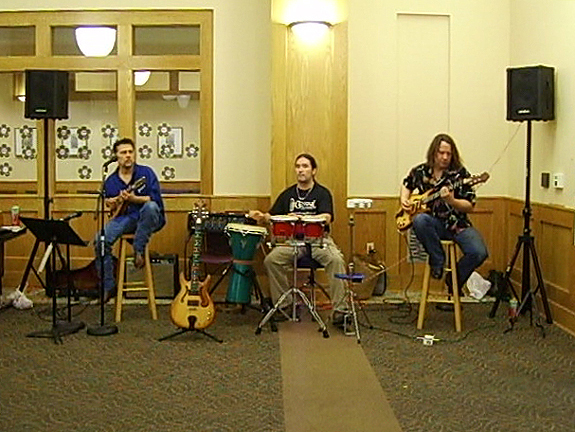 6/5/09 - A new video is posted on the video page. It's a local guitar teacher playing a modified Dynasty 7 string that I built for him. 3/30/09 - New pics are up in the gallery and more additions to the players gallery soon as well. We're also working to get some videos up on youtube (and here) so you can see and hear some of my instruments in action in a more controlled setting (not a live gig). I've also have plenty of CDs of my music if you're interested. This a really great way to hear the instruments at their best in a studio recording...just go to the CD page and order it from there. 9/23/08 - I've made the Colbert Campaign Song available for download on my MySpace page. We've also put up some new videos on YouTube from gigs this summer. You can view them here on my site at the "Videos" page. Just wanted to mention that Johnny DeGennaro will be spending the year in Nashville for recording school (starting September) so if anyone is in that area and wants to see, hear, and play a DeGennaro Guitar he will have a couple of his with him. Email me and I can connect you with him. 5/5/08 - I just wanted to let everyone know that I'm recovering slowly but steadily from having four stints put in my heart last month. I had 3 small heart attacks the last of which sent me to the hospital. It seemed to come out of nowhere but after getting "fixed up" I feel better than I have in years (even though I still fatigue easily). What I've learned is to listen to your body and if you are feeling generally bad (lack of energy, allergies get worse, body aches, etc.) or have specific red flags like left arm pain, then get it checked out and don't take an answer from your doctor like "you seem to be ok". Also, I will be taking my diet more seriously by trying to eat healthier and by reading labels on foods. So, I am still taking orders on custom guitars and am doing guitar repairs/mods and I also have several guitars on the site here that are available for purchase along with CDs and t-shirts......I need to make some money to pay for my hospital bill so if you were wanting your dream guitar then there is no time like the present. 1/29/08 - I've posted my campaign song for Stephen Colbert on my myspace page and made all the songs posted there available for free downloading (My Little Angel, I Get Up, Oil Wells, Stephen Colbert campaign song). I still have plenty of CDs available for those who like what they hear (buy here or through many online retailers). 7/31/07- We'll be playing a short show with a couple of other bands on Aug. 19th (Sunday) in Grand Rapids, MI. It's a club called McFaddens near the Van Andel Arena downtown. It starts at 8:00pm and is for those 21&over. 7/23/06 - It was a great show with tons of bands and two stages. The temp was in the 90's so it was pretty warm but everybody made it through. 7/3/06 - We will be displaying guitars Sat. July 15th at Club Soda in Kalamazoo, MI for the Summer of Mayhem 2006 show. There will be 14 bands playing all day and night starting at 2pm. There won't be a set up to try out the guitars/mandolins and it will be loud there (except for the acoustics which can be played outside) but you can see them up close if you've only been able to see them on the site. 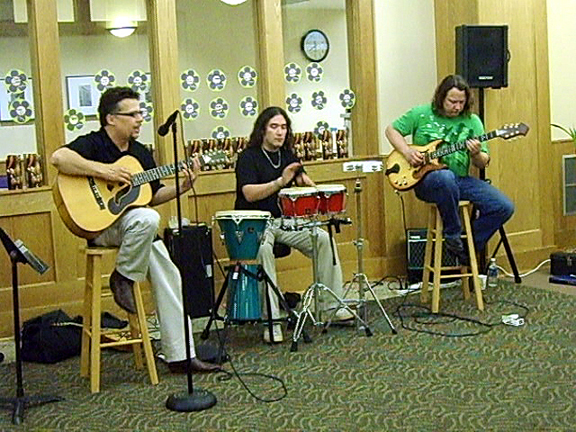 6/13/06 - Yesterday we displayed our guitars at a CD release show for a young local band here in Grand Rapids named Unaltered. We should be doing more of this soon so if you're in the area and want to see these up close then keep checking this site. 4/6/06 - We'll be playing one more time again this Sunday evening (April 9th) at Pour Arthurs doing an acoustic show featuring the songs on my CD followed by some great classic rock covers with a few other players. Starts at 6pm (no cover). They make some great dinner dishes so plan to have some food with your music. I believe that this is the first Sunday under the new liquor law which now allows hard liquor sales on Sunday so if you are going out for this reason then come by Pour Arthurs because not only will they be one of the few places open later but you probably won't find live music anywhere else. Pour Arthur's is located near the corner of 28th St. and Burlingame (near Studio 28) in Grand Rapids, MI. 3/24/06 - We'll be playing again at Pour Arthur's on Sunday night (March 26), 6pm. Come out and enjoy some music and food. It has been turning into a jamsession/covertunes after I finish playing my original material. 3/11/06 - If you are in the area, I'll be playing with my band Sunday night March 11th at Pour Arthur's. This is going to be an acoustic show and I'll be playing the songs off of my CD. Starts at 7pm. 1/1/06 - Happy New Year! I've added pics of my new Thunder King super custom fretless bass to the site("Mardi Gras Bass"). And, of course, it plays and sounds as good as it looks! More pics have been added to the gallery and more are on the way. Still plenty of CDs and t-shirts available for purchase and as always you can check my Ebay link to see what used guitars I'm selling. I will be putting some on the site too. Several of the most desirable custom are still listed for sale including the new fretless. The prices will be raised this year as I have been offering them at an underpriced level and if you can email me before it's changed on the site then I'll give it to you at that price. Material costs have risen as well as my own cost of living (and it's not because one of those makers out there buying a new boat), I'm just trying to make a living while building the best instruments you can buy. I've also become aware over the past few years that what I craft is better in design, construction, playability and sound than most other similiar products being offered to the consumer and is currrently priced below their actual value. But I'm still glad to work with the customer when it comes to payment arrangements. 10/14/05 - Just a note: If you have had some trouble accessing this site it's because the domain name provider is located in downtown New Orleans and they have quite a story to tell about trying to keep their client's websites all over the world active through the hurricane and the aftermath. Check the "available guitar" pages as there are several guitars and mandolins available. We've been busy with some orders for Dynasty guitars and there should be some new pics going up in the next few weeks including the fretless show bass we unveiled at the Summer NAMM show. I can't stress just how different from factory made guitars these handmade instruments are. They are not the same animal and so much better for the serious musician. Almost finished with a very customized Fender strat. This is not the average Fender and when the pics go up you will see why. It's going to be for the serious collector. It looks like we will not be at the 2006 Winter NAMM show this year. We are looking at a few guitar shows a little closer to home, stay tuned for any details. If you haven't purchased your own copy of the CD then I'd have to say that you are missing out and should get one right away. We have them for sale here on the site and ALL over the internet. 7/25/05 - Made it through another NAMM show, here are the pics. 7/2/05 - I'm just finishing a brand new art bass guitar that I will be unveiling at the NAMM show so if you want to see some more cool stuff then stop by my booth and be the first to see it! 6/14/05 - Just to keep you up to date, the CD "Some People" is availabe in local (Grand Rapids) retail stores like Aris' Disc Shop, Schuller Books and RIT Music Central. Next month it will be showing up in all the major online retailers worldwide for song downloads or CD purchase. The local community radio station in Grand Rapids (WYCE.org) which plays a wide range of music from known and unknown musicians from all over the world and makes a big deal about how they play local music has refused play any songs off of this CD for some reason. I know they won't play music that is even remotely heavy but most of our songs couldn't come close to fitting in that category so I'm at a loss about why especially since a portion of the material they play sounds marginal in talent. I am a BMI affiliated musician so any stations that want to play my music are good to go and any retailers who want to stock my music can contact me to get supplied. 5/7/05 - Guitar Player Magazine has the DeGennaro Hand Guitar as one of the featured products in it's '05 NAMM show report this month (June issue out in May). Stay tuned for more cool guitars that we will be making and showing! On that note, we will have a booth at the July NAMM show in Indianapolis, IN (July 22-24). Stop by and say hi, you can try out the guitars and mandolins if you like. 2/1/05 - Well, we made it through another L.A. NAMM show and though there was some problems with reserved booth assignment we had much better exposure than last year. People were constantly stopping and freaking out over the "Hand" guitar. The JazzCat also got an outstanding response and lots of great players told us how much they enjoyed playing it. The giveaway guitar drawing went off without a hitch but it was odd that half of the people we mentioned it to expressed a no intrest in winning a free handmade guitar. Many people went home with the new CD so we are hoping to hear some feedback. If you can pass the word on to people you know that would help us greatly as we are not under a large record label and have to foot the bills by ourselves. We are planning to be at the summer show in Indianapolis which promises to be much bigger than Nashville with all of the booths on the same floor. There is also going to be a midwest battle of the bands going on at the same time so my guess is that it will be one crazy show that you may want to attend. We are putting in a bid for a live performance during the show so if we get it would be great to see you there. Remember, you can try out the guitars at the shows. If you are going to be in the Grand Rapids area and are intrested in seeing how our guitars play then set up an appointment via email and we will do our best to accomodate you. 1/14/05 - The guitars have are on their way to the Namm show! Hope to see some of you there. We have some very cool new instruments to show that sound even better than they look (that is the important part anyway). The release date of the new CD is January 20th. You will be able to order CDs here on the website and purchase them at the show. It turned out great! We will be at the 2005 Namm Show in L.A. in January, be sure and stop by booth #1266! We have a CD release date of January 20th (2005) and will personally introduce the album at the NAMM show in Los Angeles as well as have a drawing for a couple of CDs. TIme to announce the Guitar Giveaway!!! Bill will be giving away one of his creations at the winter NAMM show in L.A.
We don't have a picture of the guitar yet as he is still building it but as soon as we do have one we'll post it here. All you need to do to enter is send us an email to the address below with your full name, telephone number and email address (all info is confidential) and tell us that you want to enter to win a guitar. We haven't gotten but a few entries as of 12/6 and the drawing will be on Jan. 23 in L.A. so if you want a shot at a custom guitar for $0 then get your entries in via email or at the booth! Pictures from the '04 Winter NAMM show in Anaheim. Pictures from the '03 Summer NAMM show in Nashville.